After cycling so far on such difficult terrain it is very frustrating to be back in Calgary, where we started over a week ago. 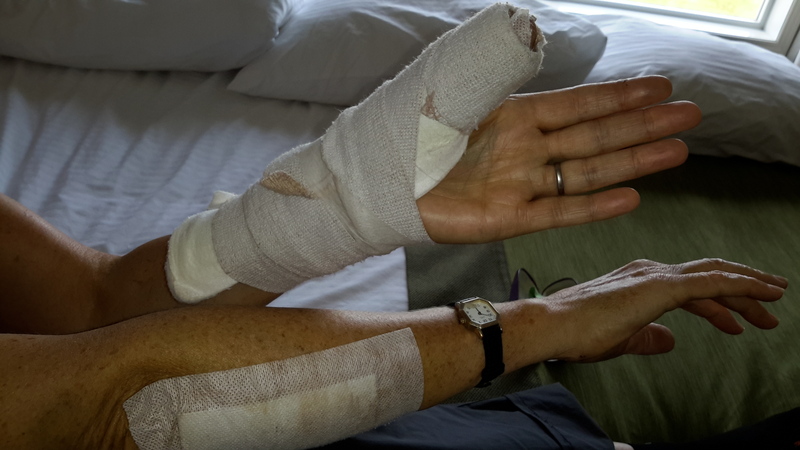 I was well patched up and stitched together in Fernie Hospital but they have referred me back to Calgary Hospital to have my broken thumb pinned. This has meant spending the long bank holiday weekend in a hotel on the outskirts of Calgary with nothing to do but see two of everything. I can’t even twiddle my thumbs! 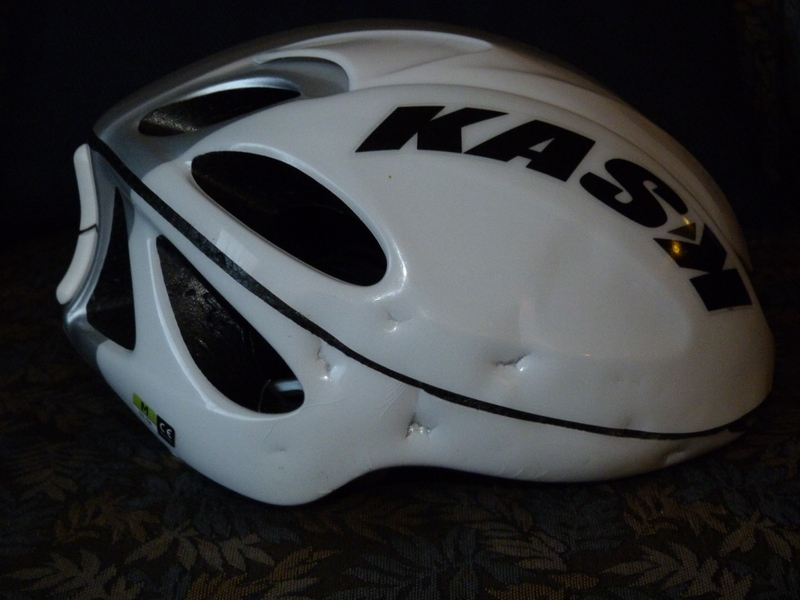 Bernie is entertaining himself today by cycling into downtown Calgary to get me a replacement Kask Infinity cycle helmet as my old one is now full of dents and holes. This is a picture that I would like the UK CTC – The National Cycling Charity, to take note of as they seem to actively discourage cyclists from wearing helmets. I was lucky that I was wearing such a good one that had extra side protection. Hopefully my concussion will have gone by Friday when we are due to get shuttled back to Fernie by a kind lady called Lori-Dawn McArthur from PractiCar and then we can decide if we are going to get ourselves a car or continue slowly by bike. In case you are wondering my bike is fine. It had a very soft landing, on me! This is probably why I am black and blue all down my right side. We are horrified by the things folk do in name lof enjoyment! So sorry your adventure has stalled (albeit tempy.). What bad luck, do hope Sarah’s injuries mend well/soon. Thanks Alison and David, I now have visited various hospitals in British Columbia and Alberta. Went to a state of the art one yesterday, brand new with more staff than patients, in Calgary. Got a fashionable blue, removable splint. Just wish I still couldn’t see two of them! Thanks Ellen, we are managing to get out and about using the car and hope to be back on the bike in a couple of weeks.